Together, we must guarantee everyone has access to clean, safe, and affordable water. It’s a basic human right. World Water Day, marked each year on March 22, is an opportunity to celebrate the immense progress made to improve access to clean water: between 1990 and 2015, 2.3 billion people gained access to a better, safer source of water. It’s also a chance to spotlight the urgent and new concerns of today: 844 million people lack basic access to a clean water source, and 2.3 billion cannot access safe sanitation. Unsafe water causes the spread of deadly diseases, such as cholera and diarrhea, which are major drivers for undernutrition in children. 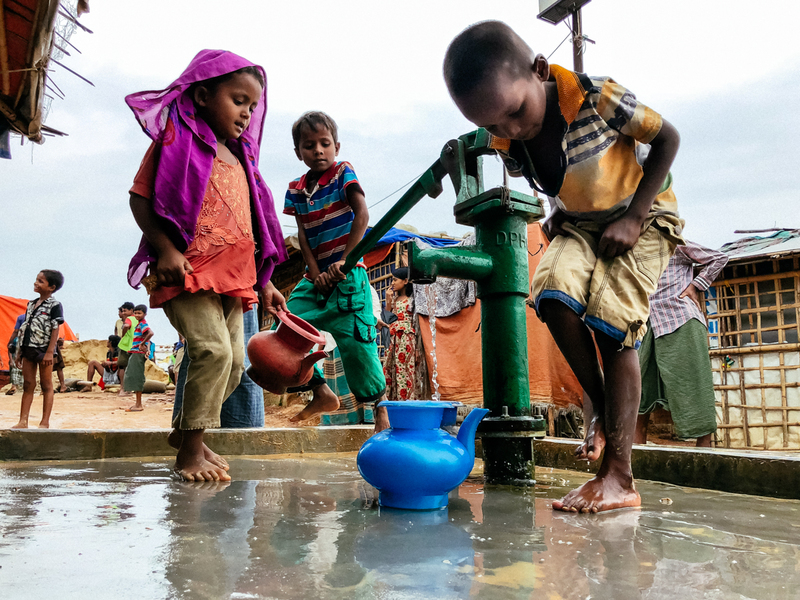 Each day, an estimated 1,000 children die of preventable waterborne diseases. What’s more, climate change makes water availability less predictable in many parts of the world as drought becomes more common and flooding destroys and contaminates water sources. Ensuring access to clean water, safe sanitation, and good hygiene goes hand-in-hand with efforts to improve health and nutrition. When clean water is guaranteed, communities are healthier and more resilient. This year’s theme for World Water Day is “Leave No One Behind.” Access to safe water is often more difficult for vulnerable populations, such as women, children, and refugees. We all have a role to play. Together, we must fight to ensure safe water for all. A Somali woman collects water in Elbarde. The number of active humanitarian crises has doubled in the past 10 years. Nearly two billion people now live in fragile and conflict-affected areas, where people are displaced and water-related infrastructure is often destroyed or neglected. Since they were displaced, Halimo and her family have been living in a village near Hudur. For the last 18 months, they have been trying to rebuild their lives and integrate into their new community. Women in South Sudan collect water. Often, they are forced to walk for hours to reach the nearest water point. When water is not available at home, women and girls are the ones responsible for collecting it 80% of the time. Often, this means they are making long and sometimes dangerous trips to the nearest water point. When we improve access to clean water in communities, women and girls are safer and have more time for school, work, and other productive activities. In South Sudan, Atap Dumo saw the impact clean water can have firsthand. She and the other women in her community had to collect the water from a well four hours away. Many feared being attacked by men or animals along the way, but they had no other choice. “Women had no say in any of community issues and nobody in our household or village ever paid attention to our concerns. We did not feel important at any level,” says Atap. In 2017, Action Against Hunger’s water and sanitation team arranged a focus group discussion with the women in the community. Our team drilled a new water point in the village, and formed a water use committee with equal numbers of men and women to manage the new system. Atap campaigned to be part of the committee and was elected chairperson. Eventually, the community, with help from Action Against Hunger, began to build latrines in their homes to improve sanitation and prevent disease. A girl in Haiti pumps clean water from a water point installed by Action Against Hunger in 2008. More than a decade later, the community independently manages the water system. Around the world, Action Against Hunger works to improve access to clean water, promote safe sanitation, and good hygiene and to build lasting impact. In the fight against hunger, Action Against Hunger has found that communities affected by malnutrition often face limited access to safe water and sanitation. Lack of access to these services can affect a child’s nutrition status through waterborne diseases, intestinal parasites, and chronic inflammation of the intestines. For all of these reasons, we must focus on water and sanitation as we prevent and treat malnutrition. During natural and manmade emergencies, we truck water into communities and install storage tanks and reservoirs. Where water is scarce or unsafe, we drill new wells and decontaminate unsafe ones, install hand-pumps, protect natural springs, tap aquifers, rehabilitate damaged infrastructure, and pipe water into hard-to-reach villages and health centers. To prevent disease outbreaks, our teams distribute hygiene kits and build latrines and hand-washing stations. We construct water filters made from basic materials and teach healthy practices like hand-washing, cooking with clean utensils, and drawing water from protected sources. We are committed to our partnerships with communities – by working closely with community members, we can forge long-term, sustainable change. We train water committees, made up of elected community members, to independently manage water and sanitation infrastructure. We also organize local health teams to model good sanitation and hygiene practices for their communities long after we leave. In a settlement for displaced people in northeast Nigeria, women carry clean water home.